The contents of your diaper bag can make or break your time out of the house with baby, but what do you really need to keep in there? It all depends on baby’s individual needs, and whether you’re packing for one baby or multiples. Also, keep in mind how long you’ll be out and what you and baby will be doing. Before we run through these baby changing bag essentials, do you have a diaper bag ready to go? If you’re converting an existing backpack into a changing bag, you’ll need to buy a folding changing mat. Yes some restaurants and public toilets have baby changing facilities, but you can’t be sure how often they’re cleaned. The majority of diaper bags, on the other hand, come with foldable changing mats, plus handy extras like insulated bottle holders. As a general rule, pack one nappy for each hour you’ll be out, plus three more to cover poo emergencies. Looking for nappies inspiration? Try Pampers Premium Protection New Baby, now a Made For Mums Silver Award Winner 2017, if you're in the UK or Huggies Little Snugglers Newborn if you’re in the States. The super cute Bambino Mio Miosolo Reusable Nappy is a hit on both sides of the pond. If you don’t have a way to hygienically bin nappies throughout the day, pack some disposable nappy bags/sacks. They also double as on-the-go storage for dirty clothes. Naty by Nature Babycare Eco Disposal Bags or Fresh Sacks Biodegradable Diaper Disposal Bags suit eco-conscious parents, while the Nappy Sacks Jumbo Box is budget friendly with 800 sacks. If baby's prone to nappy rash, pack some diaper cream. Travel sizes take up less space in a diaper bag, but most tubes and tubs of diaper rash cream are fairly small anyway. Unsure of what nappy rash is or what it looks like? Read our guide on how to spot and treat it. Leave these out at your peril! Baby wipes will get you out of many sticky situations and are essential for cleaning hands, faces and clothes (yours and baby's), not to mention wiping down mucky highchairs if baby has had a particularly fun, exploratory lunch. We love WaterWipes Sensitive Baby Wipes, formulated especially for soft baby skin. 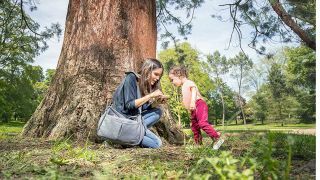 Whether you’re on a country walk or picnicking in the park, there will be times when baby needs feeding or changing but you won’t have access to water and soap for cleaning your hands. Step forward hand sanitiser, which kills up to 99 per cent of germs upon contact. There are lots of baby friendly sanitisers to choose from, including Babyganics Germinator Hand Sanitiser and Milton Antibacterial Hand Gel. How many bottles and how much formula, water or breastmilk you pack depends on your little one’s appetite and how long you’ll be out for. If in doubt, pack an extra bottle. Ready-made bottles of baby milk are handy if you're travelling off the beaten track. Are you breastfeeding? Don't forget to pack extra breastpads in case of a leak! Depending on the age of your little one, you may also need to pack a snack or three. Obviously this depends on what your child eats, and could be a jar of baby food or a bag of tasty finger foods. If your child is transitioning from bottles to sippy cups, don’t forget to pack a sippy cup of water or toddler’s juice. Many babies enjoy a dummy, so consider packing one or two, stored hygienically, when prepping your diaper bag for a day out. The NUK Genius Silicone Soother is a big hit with babies from 0-18 months, while the MAM Air Soother comes packaged in a sterilised travel case. Spit-up, drool, poo-canos… Babies and toddlers are messy little tykes. Pack a change of baby clothes in your diaper bag and thank yourself later. Extra babies clothes might include a tee or sleepsuit and a bib. Oh, and pack a top for yourself in case baby decides that the back of your shirt is a great place to spit-up. A muslin square serves a multitude of purposes. Use one to cover your shoulder when burping baby, as a nursing cover when breastfeeding in public, or drape one over the pram if the sun is too hot for bambino. Choose from classic white muslin squares, such as the Muslinz Premium Baby Muslin Squares, or vibrant designs like these aden + anais muslin squares. When choosing toys for the diaper bag, keep them small, lightweight and, of course, relevant to your baby's age and the outing. A toddler going to a restaurant will require a couple of toys and perhaps a colouring book and crayons, while a younger babe may be happy with just a colourful rattle. A baby-centred first aid kit is a diaper bag must. They often come with essentials like a thermometer and plasters, but you could add your own items such as teething gel. Try the Best Compact Baby First Aid Kit or First Aid Kit by PreparaKit. Keep a list of emergency contacts in there, too.